Soak the cashews for at least 6 hours, preferably overnight. For the crust: blend all ingredients together in a food processor until a crumbly, sticky paste is formed. Press the crust evenly onto the bottom of the mold. About 1 tbsp per square. For the filling: blend the cashews until smooth. Add the rest of the filing ingredients, except the dried strawberries. Save about 1/2 cup of the filling to use for the frosting later. Add the dried strawberries to the rest of the filing, blend until smooth. Pour the strawberry filing into the mold, freeze until set. About 30 minutes or overnight. Thaw for 5-10 minutes before serving. Pipe on vanilla frosting and enjoy! You can use fresh strawberries instead of dried ones, but I don’t recommend doing so. 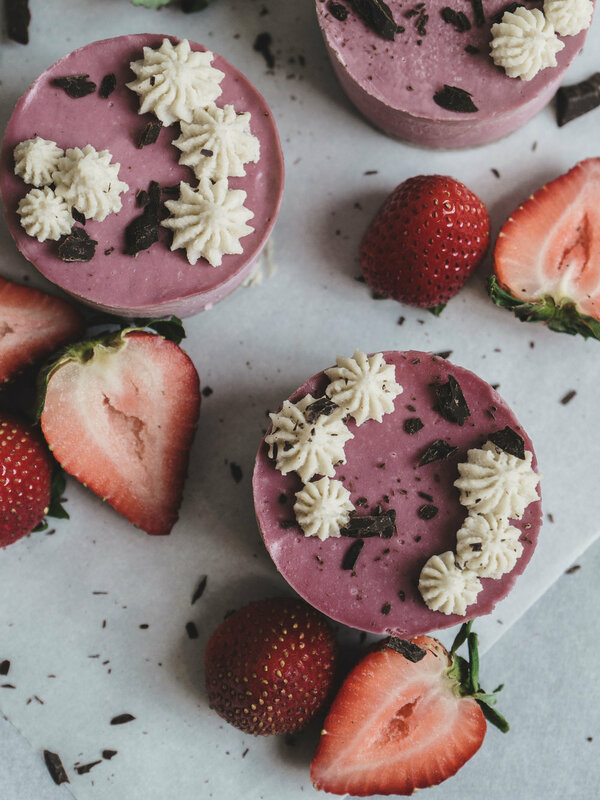 Fresh strawberries are high in water content, which will give the cheesecake an icier, popsicle-like texture. 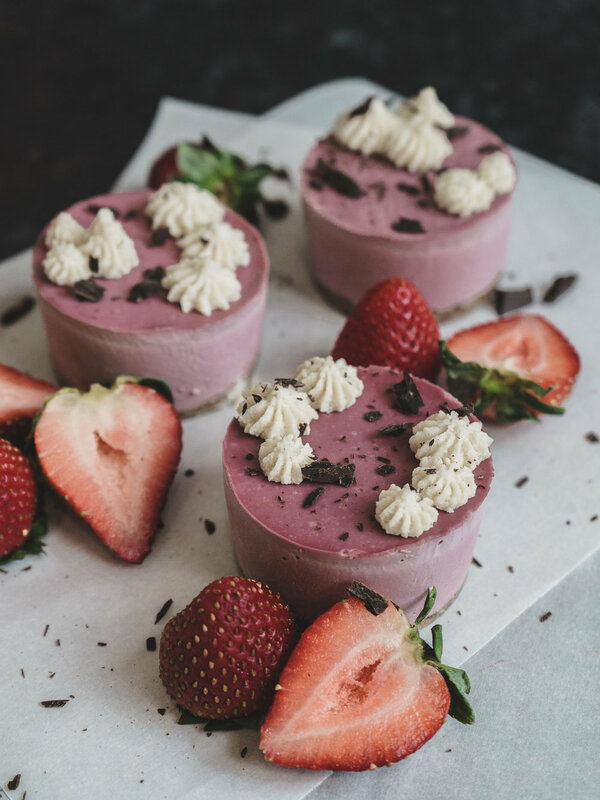 Always allow the cheesecake to thaw for at least 10 minutes before serving. This will bring out its soft and creamy texture. 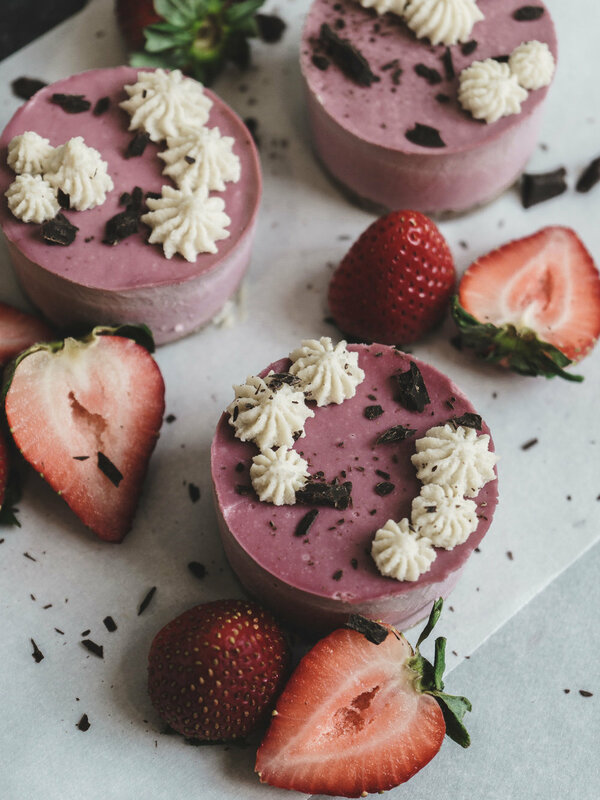 Keep the cheesecake in the freezer until ready to eat. In a large bowl, whisk together flour, almond flour, cinnamon, baking powder and salt. In a stand mixer, beat butter and sugar together on medium high until light and fluffy. About 2 to 3 minutes. Scrape down the sides of the bowl to ensure sugar and butter are well incorporate. Add egg to sugar and butter mixture, one at a time. Let the mixer run for 30 seconds in between each egg addition. Add vanilla extract and beat until well combined, stopping occasionally to scrape down the bowl. Add in the flour mixture and mix on low speed until well incorporated. Divide dough in 2 pieces. Wrap each piece in plastic wrap and roll each of them out to about 1 inch thick. Place dough disks in the refrigerator and let chill for least 2 hours before baking. Line the baking sheets with parchment paper. Roll out the dough disks to about 1/8 to 1/4 inch thick. Use a round cookie cutter (mine is about 2 inches in diameter) and cut out as many circles as possible. 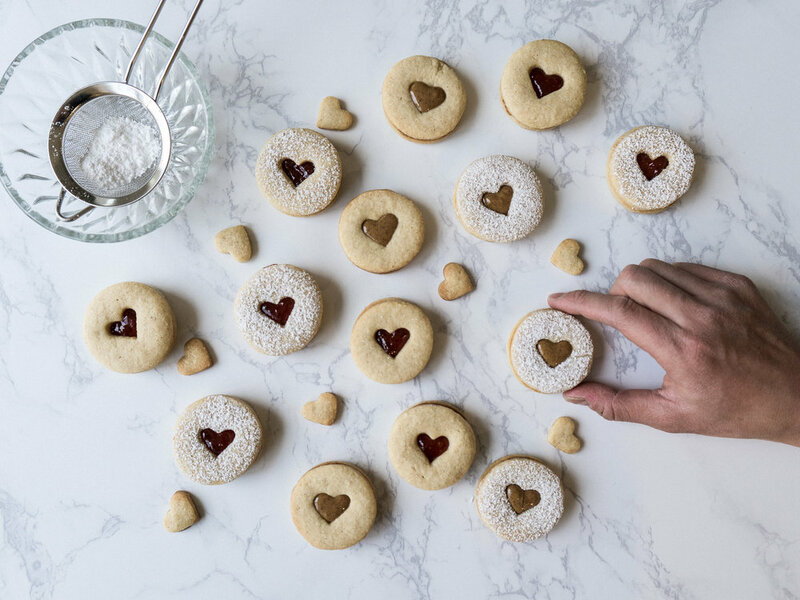 Use a smaller heart shape cookie cutter to cut out the center of half of the cookies. These will be the top cookie pieces. 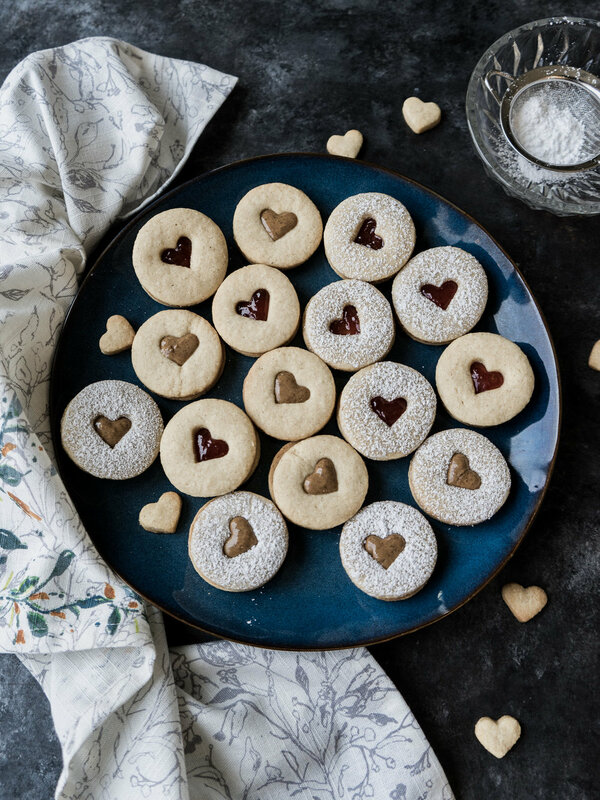 Transfer cookies to baking sheets, cover loosely with plastic wrap and chill in the refrigerator for 5 - 10 minutes before baking. Remove cookies from refrigerator, remove plastic wrap and bake for 12 to 15 minutes. The edges should be slightly golden when done. 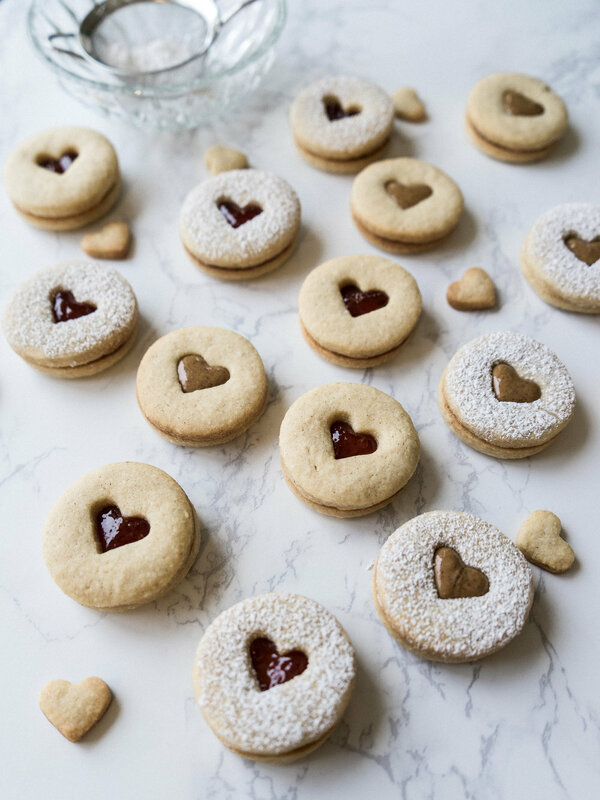 Remove the cookies from the baking sheets and let cool completely before filing. To fill, add about 1 teaspoon of jam or almond butter to the flat, bottom pieces. Place the heart cut out pieces on top and gently press together. The high fat content from the butter, almond flour and egg will make the dough very moist so make sure to flour your work surface generously before rolling them out. Alternatively, you can roll out the dough between 2 sheets of parchment paper. If the dough get soft while handling, put it back in the fridge for 5-10 minutes before continue handling. Chilling the cookies again right before baking will help them retain their shape and not spread out too much. Again, this is due to the high fat content. You can re-roll the scraps to make additional cookies if needed. The dough can be made 5 days ahead, tightly wrapped and refrigerated. Match top and bottom cookie pieces before filling to make sure they are the same size. 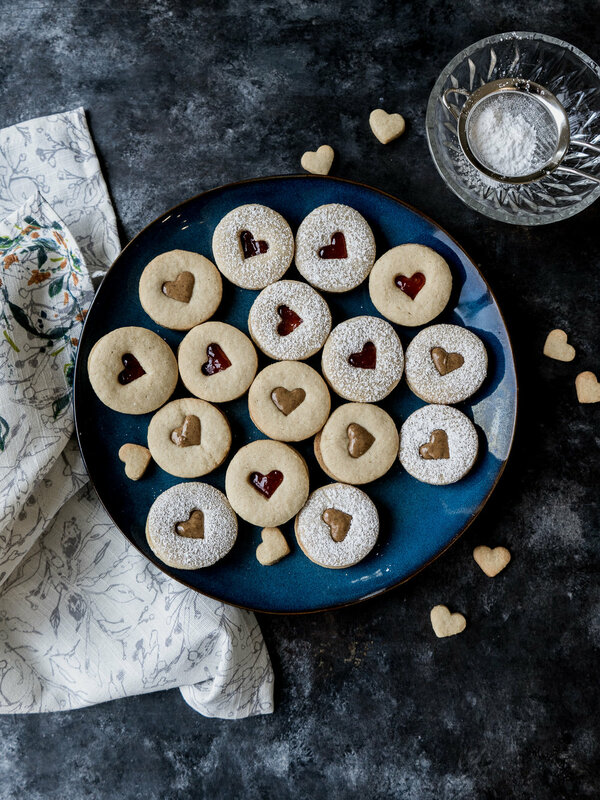 Dust the heart cut out cookies with powdered sugar first then place them on top of the strawberry jam. This will avoid getting powdered sugar on the jam and helps retain the cookies’ vibrant red center. Preheat the oven to 350 degree. In a bowl, mix together the almond flour, coconut flour, baking soda, baking powder and salt. Sift the above dry ingredients and set aside. In a blender, add together the melted coconut oil, honey or agave nectar, egg and vanilla extract. Blend on medium high speed for a couple of minutes or until smooth. Mash 3 bananas together with the coconut cream. Set aside. In a mixer, add the dry and wet ingredients together. Mix on medium speed for 3 minutes. Add the banana coconut cream and mix until everything is well incorporated. Fold in the the chopped walnut. Line the baking pan with parchment paper. Add the batter to the pan. Smooth out the top. Cut the last banana in half, length wise. Lay the banana halves on top of the batter. Gently press down so the banana is slightly submerged in the batter. Brush the top with 1 tbsp of honey or agave nectar immediately after the bread is done baking. To test the readiness of the bread while baking, insert a toothpick in the center of the pan, if it comes out clean then your bread is ready. I recommend start doing this at the 40-45 minute mark and continue testing every 5 minutes or so. If the top of the bread starts browning too early, cover the baking pan with a piece of aluminum foil. This bread is delicious hot or cold but I especially like mine slightly warm with a drizzle of coconut cream. Give it a try, I promise you’ll like it. For the crust: in a food processor, blend all ingredients together until a crumbly but sticky paste is formed. Press the crust evenly onto the bottom of the mold. For the filling: drain the cashews and blend until smooth. Add the rest of the filing ingredients, except the matcha powder and sesame seeds. Blend until creamy. Split the filling in half. Add the matcha powder to one half, blend until smooth. Pour the matcha filing into the mold, freeze until set. About 30 minutes. Add the sesame seeds to the other half, blend until smooth. 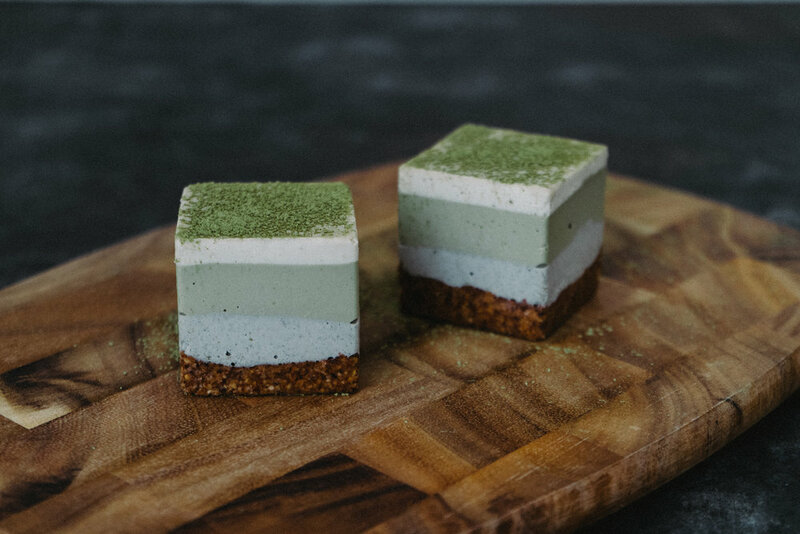 Pour the black sesame filling on top of the set matcha filing. Freeze until set, about 30 minutes. Meanwhile, blend all of the ingredients for the white chocolate topping together. Add a thin layer on top of the set matcha and black sesame layers. Dust with extra matcha powder and enjoy! I like using this silicone mold as it divides the cheesecake into serving size portions. Plus, the silicone makes it very easy to pop them out of the mold right before serving. Alternatively, you can use any baking pan and cut the cheesecake into smaller pieces after it’s done setting. Lastly, it is VERY important that you allow the cheesecake to thaw before serving. This will bring out its soft and creamy texture. 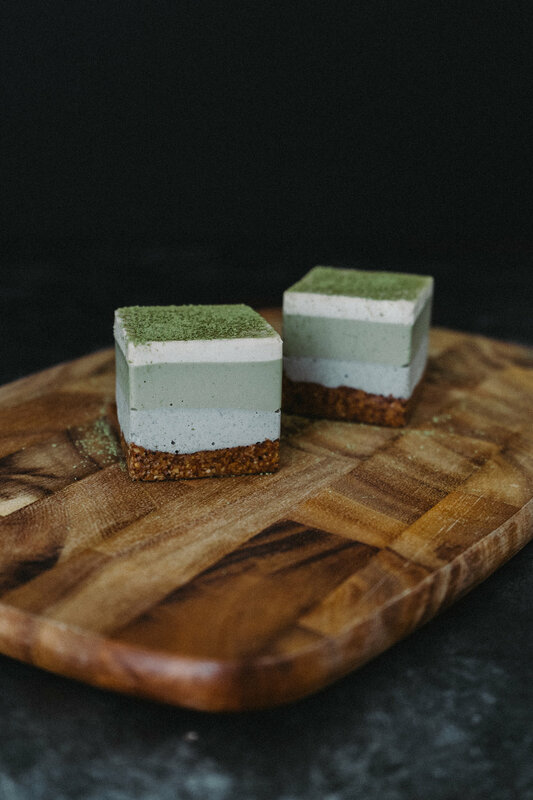 You will also be able to taste the matcha and sesame flavor much better. It feels like a million years ago since I last posted something. Life has been hectic and I have been neglecting this happy little corner for quite some time. But I am back to share the below Vietnamese Chicken Curry recipe with you. This is another one of those dishes that I grew up eating and is a stable at every family gathering or party. The most time consuming part is getting the vegetable prepped. Other than that, it’s pretty much a dump-it-all-together-and-wait kind of dish. Easy-peasy! Combine the chicken with salt, sugar, onion powder, curry powder, garlic, shallot and chili powder. Mix well and let marinate for at least 30 minutes. In a big pot, heat the coconut oil over medium heat for about 3 minutes. To test the oil readiness, add a small piece of onion, if it start sizzling immediately then the oil is ready. Add the lemon grass, ginger, yellow onion and bay leaves. Stir frequently for 2-3 minutes. Add the chicken. Stir frequently for 5-8 minutes or until the skin of the chicken is a golden yellow color. Add half of the chicken stock and coconut milk. Increase the heat to medium-high and bring the curry to a boil, about 15 minutes. Add potatoes, carrots, baby corn. Add the rest of the chicken stock and coconut milk. Add the fish sauce according to your taste. Simmer everything over medium heat for about 20-30 minutes, stirring occasionally. It’s done when the chicken is cooked through and the potatoes are tender. Enjoy hot with vermicelli, rice or french baguette. Chicken: breast and drumsticks with the skin on is the way to go. Curry powder: have you ever seen red Vietnamese curry? No? Me, neither. Get the yellow one. Coconut milk: full fat does it better, always. However, if you want to spare the calories for 2 servings instead of 1 then you can use the light/low fat option. You do you, boo boo! Fish sauce: my taste buds lean more on the saltier side and since there’s a hight fat content (thank you, coconut milk), I ended up using all 6 tbs. I highly recommend adding 3-4 tbs first and adjust thereafter. It’s an ordeal trying to salvage an overly salty dish. So add, taste, add, taste, repeat. Potahtah: they should be tender but still retained their shape. After adding them, stir sparingly to avoid breaking down the starch too much. This is also the reason why I added them in with the 2nd batch of chicken stock and coconut milk. Some recipes suggested that you add the potatoes at the same time as the chicken, I found this theory false. They cook at different time and doing so will accidentally give me potatoes soup. It’s still be a pretty solid soup but I’m here for the curry. Pickling is fun, I know this. There are so many different recipes and endless combinations of vegetables. Every air tight mason jar is a blank canvas for your creative mind. It can be suspiciously easy or extremely complicated, depends on the recipe. My An Ma’s (Grandma) pickled recipe is easy as cake and so darn delicious. Then there’s kimchi, which used to have me staring at the ingredient list and instructions for an hour before deciding to go take a nap instead. Every country has their own version of pickles, most require some type of radish or crunchy vegetable. When I saw that radishes were in season, I thought it was time to put all my pickle jars to use. Below is a recipe that’s not only simple but will be perfect for all your summer condiment needs. After a day or so, the red pigment will seep out from the red radishes, turning the brine and radishes into a beautiful shade of pink. I use them to perk up any salad with their crunch and beautiful color. They also go great with steak or BBQ meat - if you want a tart kick to go with the meaty bites. These easily overlooked condiments should be celebrated instead of being considered a forever sidekick. So go ahead, pickle all the things. After washing, thinly slice the radishes in circles. In a bowl, add the salt to the sliced radishes. Mix well and let sit for 5-10 minutes. The salt will extract the water from the radishes after 10 minutes. Drain the salt water and rinse with cold water. In a separate bowl, add the distilled vinegar, water and sugar together. Mix until sugar is fully dissolved. 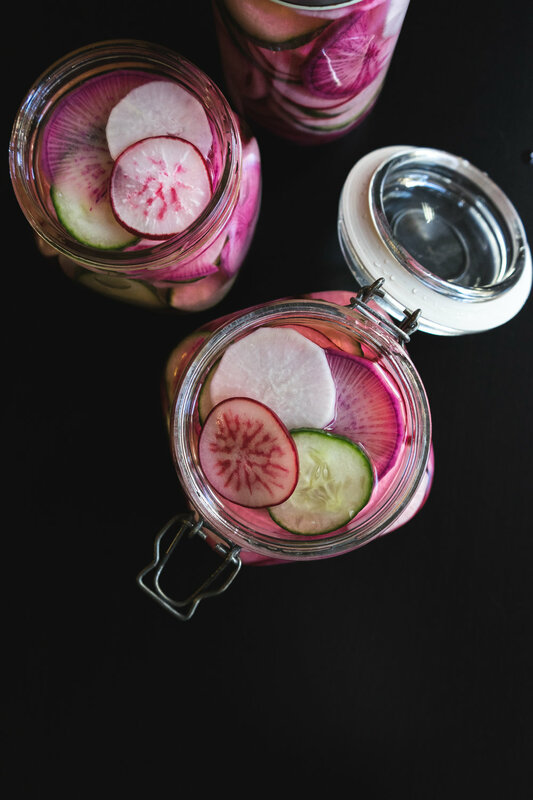 Arrange your radishes in the pickle jars. I like to alternate between all 4 to showcase all the different patterns and colors of the radish. Pour the brine over the radishes. Make sure there are enough liquid in each jar to fully submerge all of the radishes. Let the radish marinate for at least 4 hours before serving. Served cold and enjoy the refreshing crunch. Technically, these are good to go after 1 hour in the brine but I like to leave mine for at least 24 hours. It makes them extra crunchy! FACT: no one makes braised or caramelized fish as well as my Ba Ngoai (Grandma). You can argue all you want, but save your breath, she wins, always. Also fact, she won’t give me the recipe. Every time I’ve asked, she would reply with something like, “It’s very simple. You just need to add the fish, let simmer for a while, add a couple seasonings and that’s it.” Now, whenever you hear a grandma say something along these lines it usually means her recipe includes 40 steps, 500 ingredients, requires 7 days to complete and is infused with 28 different potions plus some dark magic. It’s her secret and that is that! Growing up, this dish was a staple and the epitome of comfort. There’s something about the sweet caramel flavor that blends so harmoniously with the savory fish sauce and the catfish’s fattiness. This dish served over rice on a dark cloudy day is one of my fondest childhood memories. Once we finished the fish, my Grandma would always mix some rice into the empty pan and eat it with me. This saucy, caramel-y rice is still a favorite of mine. Below is my rendition of her recipe after almost 2 decades of eating it. The most common way of making this is with catfish, though I’ve tried it with tilapia and it tasted just as good. I eventually gave up nagging her about giving up her recipe because I know, she’s just holding it hostage to make sure I visit often. Silly Grandma, I’ve figured this recipe out years ago…. but I’m still going to ask you for it this weekend. You will need to make the caramel sauce first. This is the most complex (partially scary) part of the recipe since it can go from gorgeous caramel to a fish sauce volcano in 30 seconds. So, I urge you to give it your full attention. Fill the sink or a big enough bowl with cold water that can come up to ¼ the height of the saucepan. In a tall sauce pan over medium heat, add 1 cup of brown palm sugar and 3 tbsp water. Stir well for 1-2 minutes to fully dissolve the water . Let sit and stir frequently through the next few steps. Watch as the sauce bubbles and come to a gentle rolling boil. The sauce will start changing color; starting from light yellow and gradually turning into a dark brown color with reddish tint (like how caramel looks). This should take about 8-10 minutes. Once the sauce has reached the desirable color and consistency, remove from the heat and submerge the pan into the cold water in the sink (or bowl). This will seize the cooking process, preventing the caramel from burning. Right away, add the fish sauce and stir until fully incorporated. Now, I shall warn you that this will result in the sauce bubbling vigorously, hence the need for the large/tall saucepan. In the event that your sugar cooled too fast and can’t fully dissolve in the fish sauce, return the saucepan to the stove and stir on low heat. Allow the sauce to rest for 10 minutes, it will thicken as it cools down. In a large bowl, mix together the fish, pepper and caramel sauce. Make sure the caramel sauce fully coats the outside of the fish. In a small pot (claypot if you have one handy) place the fish snugly in one layer. Pour any remaining sauce over the fish. Add the shallot, ginger and chilis. I made sure to wedge them in the open spaces so the flavor can infuse well with the fish. Cover and bring to a boil over medium high heat. Reduce the heat so the pot is at a simmer and cook for 5-6 minutes. Flip the fish pieces. Spoon some of the liquid from the pot over the fish to make sure it coats them thoroughly. Cook for another 5-6 minutes until done. Serve hot over white rice. Use a tall sauce pan to make the caramel. The sugar will boil quickly and can overflow if you’re not paying attention so the taller type of saucepan will be more forgiving. If you don’t have or can’t find palm sugar, white sugar will suffice. I personally like palm sugar because that’s the way my Grandma made it and well, Grandma always knows best. Again, I highly recommend using only catfish or tilapia to yield the best result. These types of fish have a “fall apart” texture that works best when coated with the sauce. Listen to me. Put the salmon away. When I first heard of chia seeds, I automatically didn't like them. I don't know why but there's an instant bias about something that doesn't have any taste to it. Then Billy introduced me to Mama Chia and Pinterest introduced me to chia pudding. Now I can't stop chia-ing! They are versatile, delicious AND healthy. So with that, here's a recipe that you can whip up in less than 5 minutes. Let time do all the work and enjoy. In a large bowl, mix chia seeds, coconut milk, water, agave nectar and vanilla extract together. Cover and let soak for at least 2 hours. Preferably over night in the refridgerator. Remove from the refridgerator, transfer to serving cups. Top with mango and shredded coconut. If you're soaking the chia seeds overnight, the seeds could expand too much making the pudding too thick. If this is the case, just add more water and mix well before serving. Adjust agave nectar to taste. Honey is also a good substitute. Be creative. 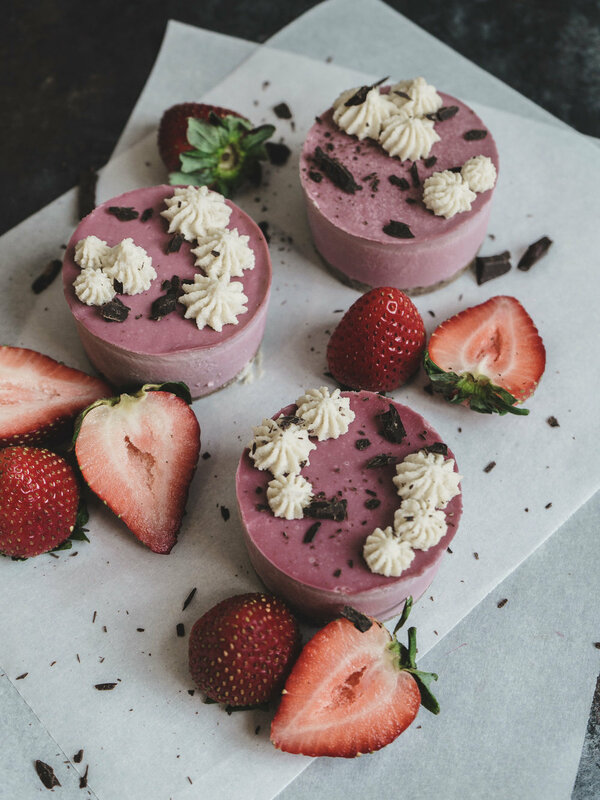 Add them to smoothies, smoothie bowls, other desserts or whatever your inner child with the urge to play with your food want to do.This pudding is best enjoyed cold. Chop the strawberries into small chunks. Mix the strawberries with the lime juice and 1/3 cup sugar. Let sit while making the ice cream base. In a medium pot, heat the heavy cream and whole milk over medium heat until the edge starts to bubble. Add in 1/3 cup sugar, stir well. Turn off the heat. In a small bowl, whisk together 2 tbsp sugar and the egg yolks until it becomes a light yellow color. Temper the eggs by adding the cream to the eggs, 1 tbsp at a time, stirring in between. Once both cream and eggs have been incorporated, return the mixture to the pot and cook over medium-low heat. Continue to stir until the mixture becomes a custard-like consistency and can coat the back of a wooden spoon. You should be able to run a finger down the spoon and leave a clean trail. Puree half of the strawberries in a blender and add to ice cream base. Mix well and strain the custard. Mash the other half of the strawberries with a potato masher or a fork, leaving some small chunks. Remove the frozen ice cream maker bowl from the freezer. Add the ice cream custard and churn for 20-25 minutes. Remove the ice cream from the bowl and fold in the mashed strawberries. Freeze for at least 3 hours before enjoying. Freeze your ice cream maker bowl at least 24 hours prior to churning. Make sure to read your machine manual since every machine is different. I made this ice cream with an ice cream maker because I am lazy and don't have the arm strength (mostly patience) to do it san machine. But if you don't have the machine, then you'll need to pop your custard in the freezer, then stir it vigorously every 20 minutes while it freezes. You can do this with a spoon or fork. Spork not acceptable. I've tried this method and it turned out well, though it does get harder as the ice cream hardens. I used the ice cream maker attachment for my KitchenAid stand mixer. I've tried two Cuisinart ice cream makers prior to this one and broke both. They're too weak, especially if you're planning on churning anything with small chunks in it. The KitchenAid attachment is perfect! Then again, this mixer can do no wrong. AMIRITE? Combine the soy sauce, sesame oil and sugar in a bowl. Mix until all of the sugar is dissolved. Cut the Ahi tuna into bite size cubes. Marinate the tuna in the sauce for 15 minutes. Add the green onion, sesame seeds, red onion and ginger to the marinated tuna. Mix well. Serve with avocado over rice. Let the tuna marinate in the fridge to maintain freshness. Low-carb option: serve the poke over a bed of kale or mixed greens. Preheat the oven to 325ºF. Combine the heavy cream and vanilla extract in a medium pot. Bring to boil over medium-high heat. Remove from the heat immediately, cover and let sit for 15 minutes. In a bowl, whisk together 1/2 cup sugar and the egg yolks until it becomes a light yellow color. Temper the eggs by adding the cream to the eggs, 1 tbsp at a time, stirring in between. Once both the cream and eggs have been incorporated, strain the liquid one more time. This will ensure the custard is extra smooth. Pour the liquid into 6 ramekins. Place the ramekins into a large cake pan. Add hot water into the pan to about halfway up the sides of the ramekins. Bake for approximately 40 to 45 minutes. Remove the ramekins from the pan and refrigerate for at least 2 hours. Remove the ramekins from the refrigerator and let sit for 30 minutes prior to browning the sugar top. Coat the surface of each ramekin evenly with 1 tbsp of sugar. Using a torch, gently melt the sugar and form a brown, crispy top. Let sit for 5 minutes before serving. Garnish with fruits and powder sugar. After baking, the Crème Brûlée should be set but still a little jiggly in the center. It hurts my soul to see burnt sugar tops on Crème Brûlée. To avoid that, rotate the ramekins slowly as you are torching the sugar. This will allow even browning and prevent the sugar from burning. The sugar top should be a light brown color, not dark brown. The sugar will burn faster the longer you torch so eyes on the custards, folks! Only torch the Crème Brûlée when you are ready to eat, refrigerating after torching will turn the crispy tops soggy. Trust me, nobody likes that.